Hi Josh, glad you liked the mirrors we used to make our living room look wider (previous decor post). 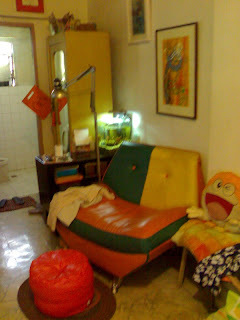 The widest point of our living area is only 3.9 meters but everyone always says the place is spacious. Opposite the mirrors, glass walls open to a porch. Left or right the eye is not dead-ended, and we replaced the bulky old sofa with a smaller one. And the higher than average ceiling is a bonus. 1) Room is an irregular shape, only 2.5 meters wide and 6 meters long. 2) Wants a repaint, preferred colors gray, blue and orange. 3) No place to hide clutter, takes too long to clean. 4) Needs more cooling, only electric fan is available. 1) Open up about two-thirds of the wall facing the deck and replace with grillwork inside and acordion screen doors outside. Curtains or shades will close off this off at night. space seem bigger. Added bonuses are more light and air. Your roof overhang would have to be at least one meter, though, so the rains don't come in. Our dining alcove (shown next post) is an example. 2) Do the same with sliding glass. Glass is an insulator, though, so you'd need airconditioning.